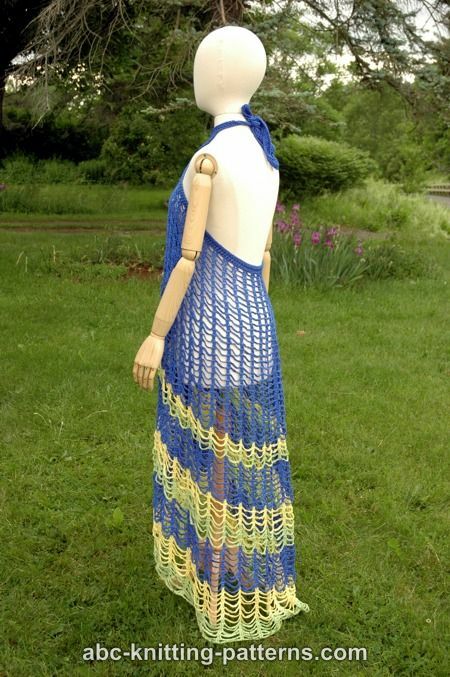 This pattern is easy, quick to crochet and is perfect for the summer beach season. 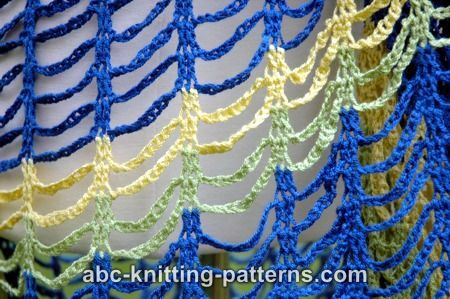 I used two strands of Bernat Handicrafter Crochet Thread. 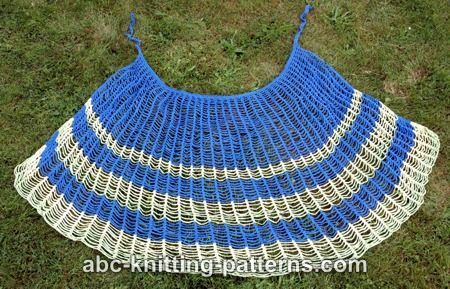 This has the benefit of making the pattern faster to crochet and also gives the cover-up better drape, complimenting any figure. 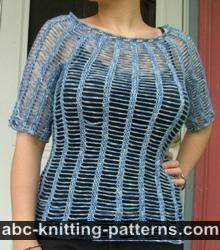 The pattern is very easy to adjust in terms of length and width to fit your needs. Colors can be chosen to your taste... bright and sunny is best, of course! 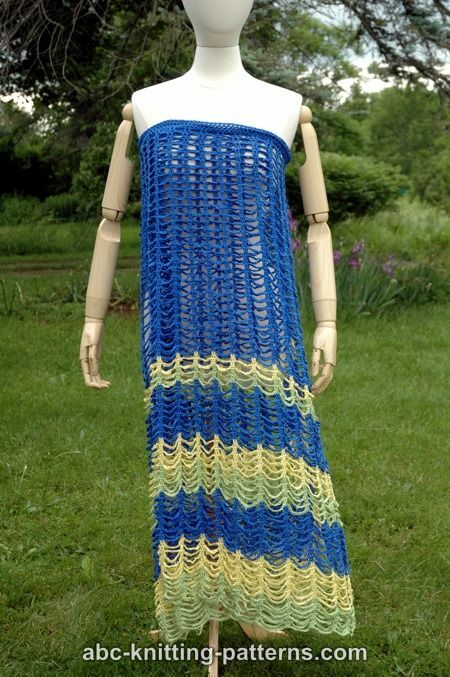 Note: the cover-up is crocheted using 2 strands of yarn. 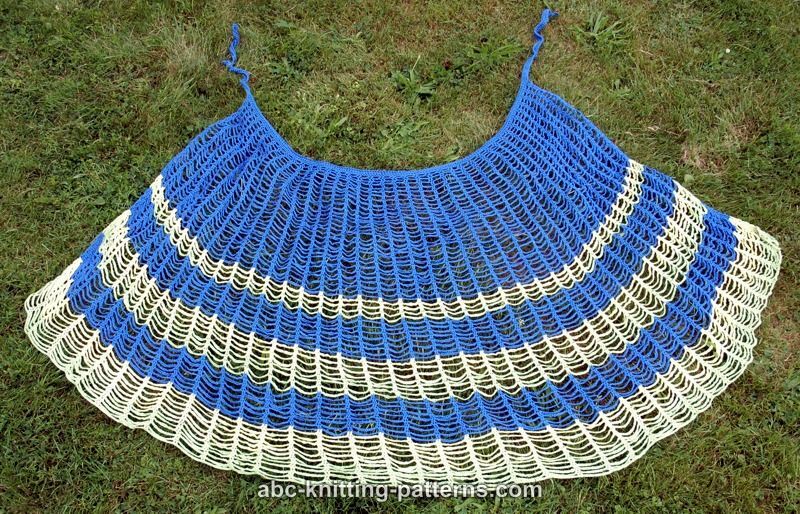 You can use any other DK or sport weight yarn instead. The cover-up is worked top down back and forth. The belt is worked afterwards. 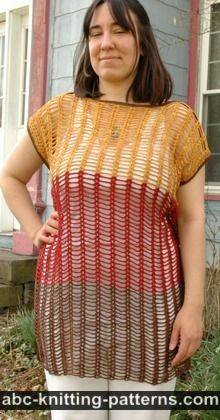 If you would like to make it shorter, work less rows before the first CC stripe. Row 1: 1 dc into 4th ch from hook, 1 dc into next ch, ch 2, skip 2 ch, *1 dc into each of next 2 ch, ch 2, skip 2 ch, repeat from * to last 3 sts, end with 1 dc into each of last 3 ch. Turn. Row 2: ch 3 (counts as 1 dc), *1 dc in each of next 2 dc, ch 3, repeat from * to last 3 dc, end with 1 dc into each of last 3 dc. Turn. Row 3: ch 3 (counts as 1 dc), *1 dc in each of next 2 dc, ch 4, repeat from * to last 3 dc, end with 1 dc into each of last 3 dc. Turn. Rows 4-5: ch 3 (counts as 1 dc), *1 dc in each of next 2 dc, ch 5, repeat from * to last 3 dc, end with 1 dc into each of last 3 dc. Turn. Rows 6-8: ch 3 (counts as 1 dc), *1 dc in each of next 2 dc, ch 6, repeat from * to last 3 dc, end with 1 dc into each of last 3 dc. Turn. Rows 9-12: ch 3 (counts as 1 dc), *1 dc in each of next 2 dc, ch 7, repeat from * to last 3 dc, end with 1 dc into each of last 3 dc. Turn. Rows 13-17: ch 3 (counts as 1 dc), *1 dc in each of next 2 dc, ch 8, repeat from * to last 3 dc, end with 1 dc into each of last 3 dc. Turn. Rows 18-23: ch 3 (counts as 1 dc), *1 dc in each of next 2 dc, ch 9, repeat from * to last 3 dc, end with 1 dc into each of last 3 dc. Turn. Rows 24-30: ch 3 (counts as 1 dc), *1 dc in each of next 2 dc, ch 10, repeat from * to last 3 dc, end with 1 dc into each of last 3 dc. Turn. Rows 31-38: ch 3 (counts as 1 dc), *1 dc in each of next 2 dc, ch 11, repeat from * to last 3 dc, end with 1 dc into each of last 3 dc. Turn. Rows 39-48: ch 3 (counts as 1 dc), *1 dc in each of next 2 dc, ch 12, repeat from * to last 3 dc, end with 1 dc into each of last 3 dc. Turn. Rows 49-60: ch 3 (counts as 1 dc), *1 dc in each of next 2 dc, ch 13, repeat from * to last 3 dc, end with 1 dc into each of last 3 dc. Turn. Rows 61-70: ch 3 (counts as 1 dc), *1 dc in each of next 2 dc, ch 14, repeat from * to last 3 dc, end with 1 dc into each of last 3 dc. Tie off. With MC chain 80, with the top of the pareo facing you, work 156 sc along the top, ch 80. Turn. Row 1: work dc along the ch 80, 156 sc and ch 80. Turn. Row 2: work dc to the end of the row. Tie off. 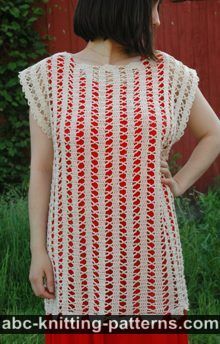 I'd like to make this but am having a hard time finding Bernat Handicrafter Crochet Thread as the pattern calls for. Can you point me to a source or suggest a good alternative? 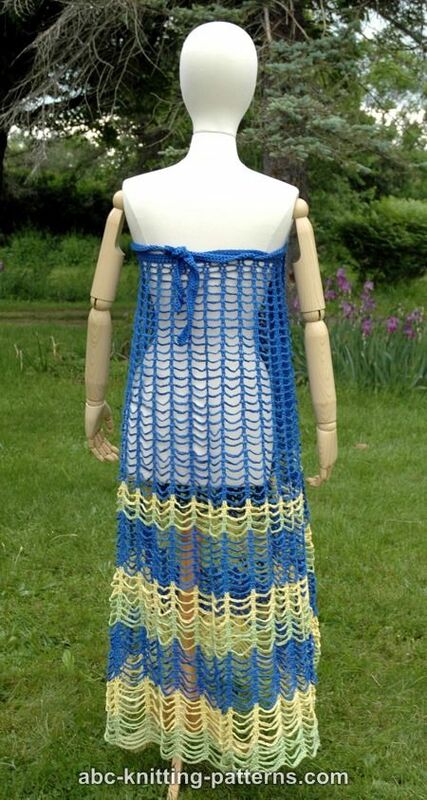 Thank you for this wonderful-easy to do beach cover-up. The pattern is very clear. It will be my next project for summer! After doing over 40 rows I ended the row too early and ended up tearing out over 20 rows. I placed a marker at each end to prevent this mistake from happening again.